If this is the type of feedback you’re getting from your content—awesome job! You understand your audience; you hit a “trigger point” that connects on an emotional level, and you’re likely to have that person follow through on your call-to-action. When it comes to email marketing, however, generating this type of response from the majority of your list can be a huge challenge. Because email is so personal, it’s difficult to share a message that’s universal to your entire audience. Not only that, you’re delivering a personal message directly into their inbox that comes across more urgent, as opposed to a post or podcast episode that people can choose to consume on their own time. If your email seems out of place, you risk unsubscribes or long-term inactive emails from those who just aren’t feelin’ it. In an auto-responder email series, this is even more dangerous. Auto-responder emails are pre-written emails that are sent to individuals sequentially over time after they subscribe. The danger here is that because you set it up to be automatic, you’re more likely to forget about it. I get it, though. That’s why you have an auto-responder series in the first place—to set up something once for automation down the road. However, all it takes is one email that doesn’t align with a subscriber to convince someone “this is not for me anymore,” and lead them to click unsubscribe. And how many emails are we supposed to have in our auto-responder series? I had thirty-five at one point, and based on what Steve Chou (SPI Podcast Session #143) and Dan Faggella (Session #159) said, the longer the email sequence, the better. So, how do we solve the dilemma of sending more targeted emails to every subscriber on our list? We segment our lists into groups, and write emails that actually matter to those groups. Segmenting your list is exactly what it sounds like—you’re putting your email subscribers into different groups so that you can send emails that actually matter to them. Valuable, educational content to build trust and authority. Success stories to show proof of concept and build even more trust. Emails meant to drive sales. A thank you email for purchasing the product, along with important information about how to access their product. A follow up email two days later to make sure everything is running smoothly and to check up on their progress. A survey email fourteen days in to gauge what they like and dislike about their experience so far with your product. A free and unexpected gift twenty-eight days later as a thank you, which happens to be two days before they get billed for their membership. The gift reminds them how great the purchase was, and when they have to pay the next installment, they are more likely to be happy with it. A promotion for a secondary product or course you have for the same audience. The non-buyer versus buyer example is simple and makes complete sense. Each group deserves different types of emails, and your buyers would hate to see an email pitching a product they’ve already purchased. All of this can all be done automatically through most email service providers (ESPs). I’ll get more into the technical details of list segmentation later in this post. Keep it simple (at least at first). You can create incredibly complex automation sequences and have hundreds of different segments in your email list, but when you’re first starting out, keep it simple. The non-buyer versus buyer segmentation is one of the simplest to understand, implement, and one of the most useful. There are, of course, a lot more segmentation options within our email list, and it’s not always a “this or that” type of situation like in the above example. Some people could be placed into two or more segments of your audience, depending on how you’d like to do it. For example, maybe they are a non-buyer, and they are also interested in a particular subtopic of your niche. Let’s check out other segmentation options you could explore. Most email service providers let you create and save new segments from the existing list of subscribers you already have without collecting any new data from your subscribers. 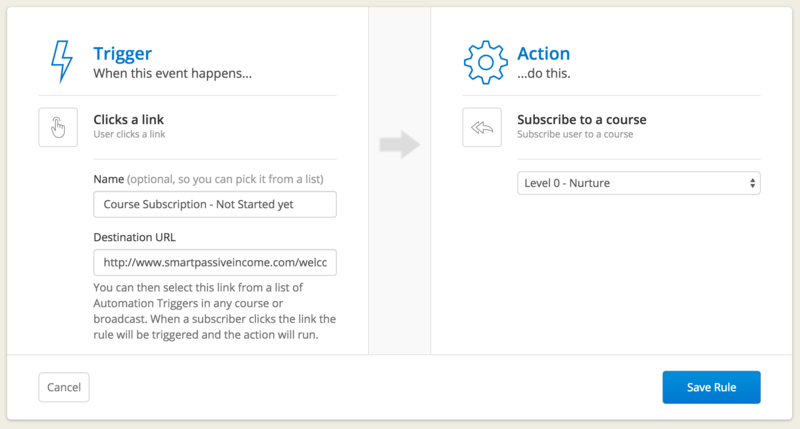 For example, you can extract a segment of your list based on when they subscribed. Perhaps you’d like to create a segment of all the people who subscribed to your list last month, although this isn’t particularly useful in my opinion. You can also segment your list based on geographical location. That can be useful for some businesses that geotarget certain email broadcasts and campaigns, but again we’re just scratching the surface of possibilities. Segmentation truly becomes powerful when you begin to create groups of people based on their interests. So the question is . . . how do you determine a person’s interest, and what do you do with that information? Although your website targets a specific market (hopefully), there are likely sub-niches or specific interests within that market that you can and should be catering to. And in all likelihood, you’ve done a lot of the heavy lifting already in terms of figuring out what those subtopics are. They may be reflected in the categories that you’ve created on your blog, or perhaps in a survey you conducted. If you need help to figure out these subtopics, go into your analytics and find the most popular content you’ve published. You can also use BuzzSumo to help you even further to figure out what topics are of interest to your audience. 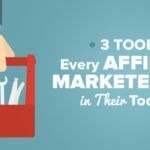 By conducting this research, in a short time you’ll discover a number of content types or subtopic “buckets” that live inside your audience. In the health and fitness industry, for example, there are people who are interested primarily in losing weight, and there are others who are more interested in strength training. Within strength training, there are those who are interested in looking beefed up, while there are others who are in it to look lean. In the photography space, there are those who are interested in wedding photography, newborn and family photography, and those who prefer corporate work (just to name a few sub-niches, because there are several). If you had a site that catered to photographers, wouldn’t it also be useful to know whether or not a subscriber used a Canon or a Nikon camera—or something else? It’s really up to you how you’d like to divide your audience, however when it comes to email segmentation, dividing your audience into two or three groups is the best way to start, because it can be entirely overwhelming (trust me). Some ESPs allow you to “tag” people as well, which is helpful because you can mark them with a particular interest without having to worry about necessarily putting them into a completely separate email sequence. It’s like a second layer of segmentation, and you’re able to send broadcast emails to people with one or more tags associated with them. In the case of the hypothetical photography site, I might have different segments (and therefore email sequences) for each type of photographer I wanted to target (wedding, family portraits, corporate), but also tag people over time with what kind of camera they use. The tagging could be useful because perhaps I get access to a special deal for a new Canon lens that just came to market. Well, it’s no use sending that to my Nikon photographers. So I’ll send an email broadcast with that special deal just to those who are tagged with a Canon tag only. Do you see how this works and how powerful segmentation can be? And at the same time, do you see how crazy and out of control this could get? Start simple, and you can always further segment your audience later. Now, let’s get into how you can segment your audience. Here’s a recent post I published about why I switched from Aweber to Infusionsoft to Convertkit, in case you’re interested. Let’s start with learning about how to figure out the interests of your existing subscribers. The easiest way to begin to segment the audience you already have on your list (i.e. a main list that you drop all subscribers into) is by getting them to click on a specific, specialized link. That *click* will trigger the email service provider to put that person into a grouping that you’ve previously specified. A “course” in ConvertKit is simply a set of auto-responder emails that people in that course will receive over time. Here, I’m creating a link for people to click on who have not yet started their business. I setup the automation rule so that when people click on this link, they will be moved from my main list into Level 0 – Nurture. Level 0 – Nurture is just my own way of naming and categorizing this group, which is how this group is defined across my entire team. And of course, emails sent to this group over time all have to do with setting people up to start their own business for the first time. As you can see, this allows me to have more targeted communication with each of these segments of my audience. When I moved to ConvertKit, all I had was my main list because I wanted to start fresh with my segmentation, so I sent a broadcast email with this copy and instantly my audience began to segment themselves. In addition to having this survey sent to my subscribers in a broadcast email, I have it included in the first follow-up email in my “New Subscriber – Unknown” group, which is the main list that people subscribe to if they haven’t come from a specialized opt-in form that automatically puts them into a segment, which I’ll talk about in the next section. 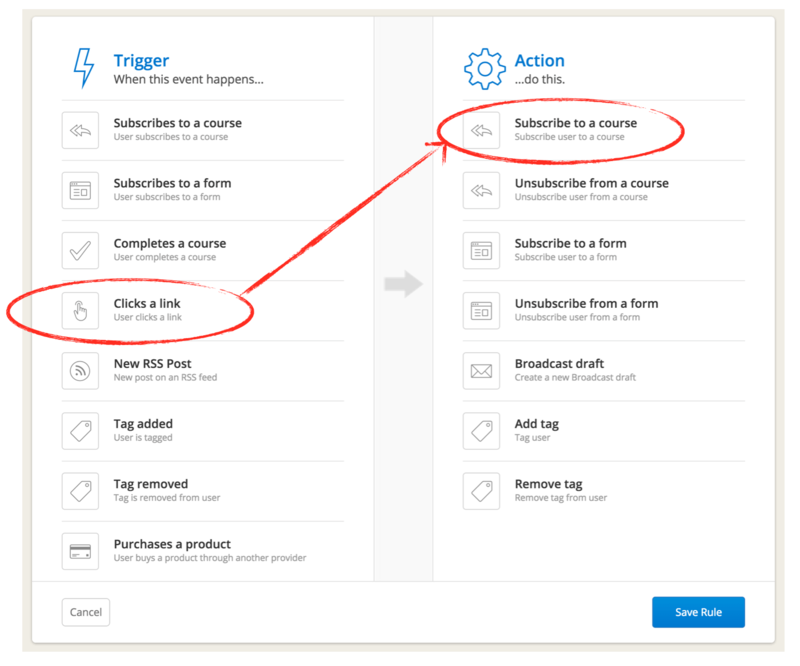 Additionally, using the automation rules in ConvertKit, I have it set up so that when people move to any one of these three segmented courses, they are taken off of my “New Subscriber – Unknown” group. Again, the purpose of the main list is to get them to segment themselves, and I’ll try to make this happen over time in a number of emails that they receive—not just that first one, because some people don’t get the first email, or don’t click the link that time. Clicking on a link in an email is a great way to segment your audience, but we all know not everyone opens our emails (although you will experience higher open rates as a result of segmenting your list—yay!). But an even better way to begin to segment your audience is to do it based on the actions people take on your website. Do this, and you can skip the step above and get right into content that matters for your audience. The best way to explain this is through another example, so let’s go back to our photography website example. There are way more—but again—keep it simple. We write a blog post titled: 5 Mistakes All Beginner Wedding Photographers Make. 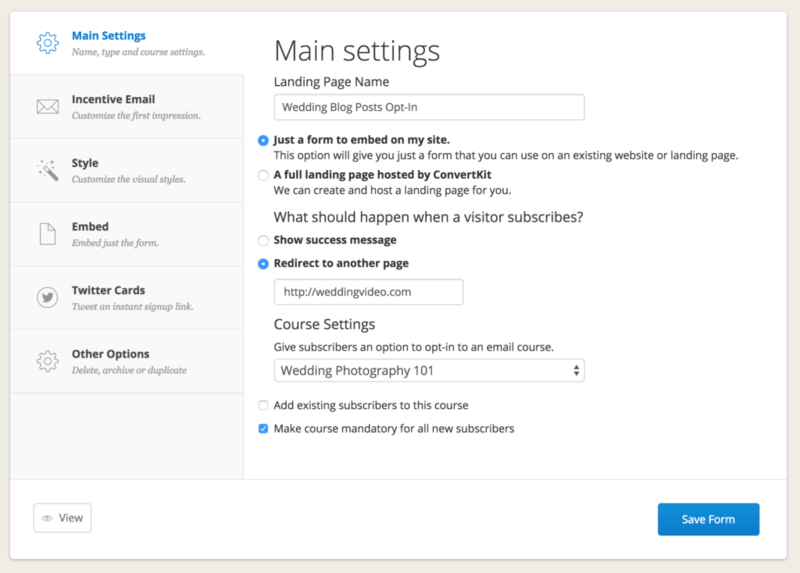 At the end of the post, we include a form that automatically segments new subscribers on this page into the wedding photography segment. 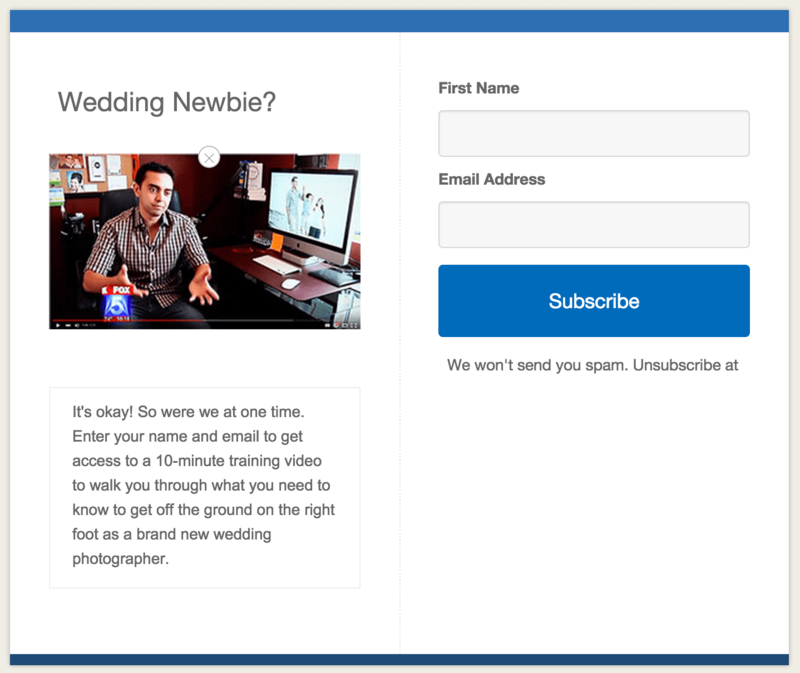 We can assume that people who read this post and opt-in for this type of lead magnet will be interested in the wedding photography niche, so instead of sending them to our “New Subscriber – Unknown” Main List, we’re going to put them right into the wedding photography segment. And now, when people subscribe, they’ll automatically be sent content that is relevant to them. Going back to keeping it simple, if you’re going to segment your audience in one way over the course of the life of your online business journey, you’re going to want to separate buyers and non-buyers. If people buy product X, then they get put into an email sequence that corresponds to that product. Other things could happen at the same time as the purchase—they are taken off of the non-buyer email sequence, and they are tagged as having purchased that product. The latter makes sense, but the former might seem like a duplicate. But here’s why tagging a buyer is smart in addition to putting them into a specific email sequence. Over the course of the life of a subscriber, they’ll go through various email sequences that you’ve setup. They’ll be put into one sequence or funnel, and then dropped into another one after taking certain actions or “leveling up,” if you will. You could hypothetically have someone be a part of two or more automatic email drip sequences, but that’s a lot of emails and you want to keep that subscriber’s focus, not overwhelm them. As people move throughout your various email sequences, it’s still nice to have a record that they’ve purchased something from you, so tagging them marks them as such. Then later when you come out with version 2.0 of the product, no matter where they are at in your emails you can send a broadcast to all purchasers informing them about the new version. The technical set up for this in ConvertKit is rather easy. They are continually adding new integrations so check to see if your shopping cart, if you have one set up already, is compatible. They do integrate with Zapier, however, which can make it easy to connect any shopping cart and/or payment processor. I’ve found that ConvertKit works especially well with Gumroad.com. Here’s a rule I set up so that when people get access to the free version of The Smart Podcast Player, it puts them into a sequence of emails specifically for those users, which includes valuable content for learning to use the software, educational information for podcasters, and offers to upgrade to the paid version. With the books, products and courses coming out in the future here on SPI, this kind of simple segmentation and automation will be extremely useful, and I hope this post has been helpful for you, as well. Is Email Segmentation a Requirement? Segmentation isn’t mandatory, but I highly recommend it—if anything—for the purpose of delivering better value to your audience. To reiterate for the n’teenth time, start simple. As you begin to grow your email list, you’ll discover certain segments that make sense to cater to, but start out simple and you can always grow and expand segmentation from there. If you’ve done any segmentation in the past, please leave a comment below about your experience. Did you mess up like me and try to do too much too fast? What segmentation areas are really working for you? And if you haven’t done any yet, I’m hoping this post was a helpful introduction for you. I’m excited to see where you take it. And like I said, most email service providers will allow you to do this, but if you’d like more information on ConvertKit, check out my demo here. Cheers, thanks, and here’s to you and your success!